This magnificent spectacle stands in solitude outside of Gerlach, Nevada, quietly marking the passing of time. Layer upon layer building skyward, this leaking geothermal well spews a steady stream of scalding, mineral-laden water. 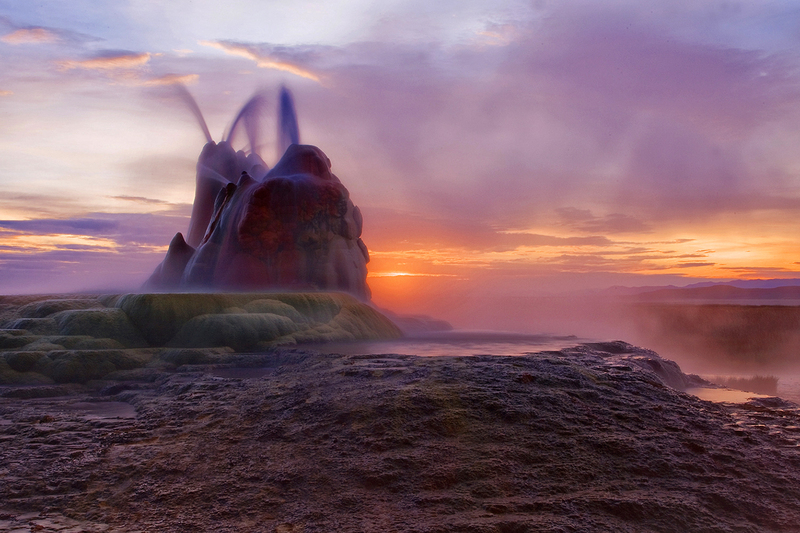 Fly Geyser began forming in 1964, and continues to grow several inches a year. This exotic and misty landscape was captured as the sun began its rise over the stark, hauntingly primitive Black Rock Desert. The luminescent sky, dramatically colored by an oncoming storm, infuses the scene with an other-worldly tone.